My friends and family seemed adamant, but I still wasn’t sure what to think, so I turned to the source I trusted most: the Internet. It explained that Mexico was crazy dangerous right now, riddled with gangsters and crooked cops, and a CNN.com report told me that if I went to Mexico, I likely would come back without a head. I agreed that this was probably the case, but there was a $100 trip cancellation fee, so off I went. When I arrived at the Cancun Airport, I was on high alert for suspicious characters, and oh boy, were there a lot of them. It seemed like every person I walked past looked at me and said, “Buenos dias!” which translates, roughly, to “I have a weapon!” I made sure to avoid eye contact and completely ignore them, because it’s never safe to assume that people from other countries are as tolerant and accepting as Americans like me. My hotel arranged a ride from the airport. The driver was the quiet, suspicious type who smiles and asks how your flight went. He took me to my resort, and I was so relieved that he didn’t rob me that I tipped him with all the cash in my wallet. The hotel was actually quite nice –it was right on the beach and boasted many of the luxuries I’ve come to expect from fancy American hotels, like mini shampoos. I wanted to hit the beach right away, so I slapped on SPF 50 sun block (I had read that after people, UV-rays is Mexico’s most dangerous killer) and sprawled out on the sand for some much-needed R&R. It’s kind of tough to have a vacation, though, where your primary goals are to relax and not get murdered. Luckily, I soon discovered that reports of Mexico being hazardous and inhospitable are exaggerated and inaccurate. The hotel staff, for instance, was incredibly welcoming and friendly. 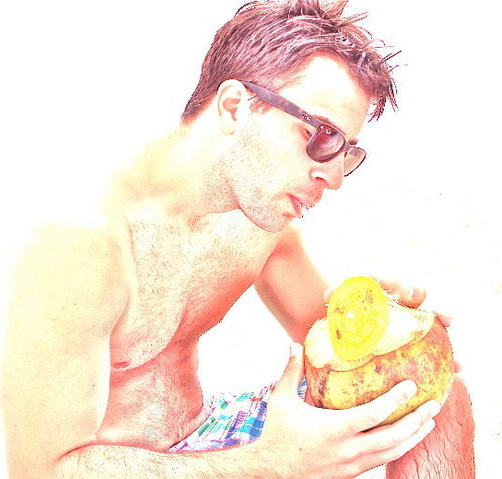 One day at the beach, the hotel bartender approached and gave me a drink in a hollowed out coconut. At first I was wary. What was this mysterious coconut concoction? Was it dangerous? The wooden tip on the stem of that novelty mini-umbrella looked awfully sharp. I took a hesitant sip, only because I thought if I didn’t the man might attack me, and my only protection was a pair of trendy sunglasses. You can imagine my excitement when I discovered that this drink was A) delicious and B) rum-based. I proceeded to suckle it down with alarming focus and efficiency. Everyone bent over backwards to make me feel comfortable, which I appreciated. The hotel staff, bless their hearts, would make an effort to speak English to me. In return, I would speak Spanish to them. I didn’t have to, but I’m a college-educated American and felt responsible to lead by example and be a good ambassador for my country.